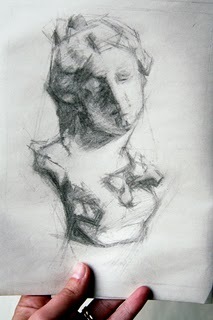 I've been reading a lot about cast drawing recently, which are formal studies of plaster casts of sculptures, so I decided to try one. I'll be working from this cast for several Friday sessions. 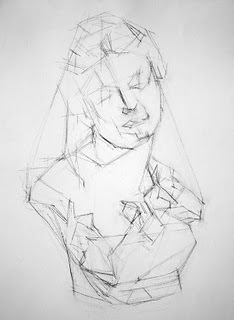 The first drawing is a small 6-inch sketch done on newsprint in about an hour, done just to quickly analyze the form and begin to understand the proportions. I included my hand in the shot so you can see how small the drawing is. The second is the block-in stage of the large drawing, about 18 x 24 inches. I used what I learned from the first sketch to start mapping out the main planes and proportions. I was impressed by how easy it was to draw it large, after learning from the small sketch. Art Shed News: The floor has been laid and one wall is up! I can stand on the floor and imagine my little space more clearly than ever. The huge white north sky is overhead, shaded from the south by the main house. It will be a tiny studio, but it will have perfect light. Hopefully I'll be moving in on or before my 36th birthday, June 7th.